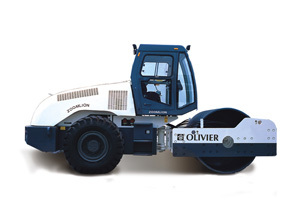 OLIVIER / Zoomlion Full Hydraulic Single Vibratory Roller; Specific vibratory drum design with a special low speed sealing structure increases the reliability considerably and extends the maintenance period. Independent lubrication technology makes sure the bearings are well and fully lubricated, thus improving their service life. Strengthened supporting structure enjoys good rigidity and adopts world famous brand bearings. This increases the service life considerably (almost 100 %) and so represents equal life design principle perferctly.